Get complete Edition to export unlimited contacts of Lotus Notes at worthy cost in $69 only. Is there any technique to convert Notes Address Book to vCard format? 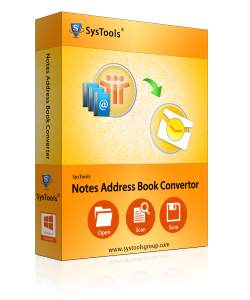 Notes Address Book Converter is an excellent solution that is capable of converting NSF contact file into Outlook PST, Excel and vCard formats. The resultant files created by the tool can be easily opened and synchronized with latest devices and services. How many address books can be added to the software for the conversion? Using the software you can easily convert any number of contacts from the address book of Notes. It must be noted that only one file can be added to the tool in one go. Is there any limitation applied on the maximum size of Notes contacts file added to the tool? Notes Contacts to Outlook does not impose any restrictions related to the maximum size of the file. It has potential to convert any number of contacts stored in the file. What is the format of resultant PST file generated by the tool? The software creates PST file of both ANSI and Unicode format depending on the user's requirements. It can be easily opened in the suitable version of Outlook. Is it necessary to have Lotus Notes installed in the local machine for the proper working of the tool? Yes, for the conversion of notes address book into requisite format its insatllation on the local machine is mandatory.